Of Japan’s four main islands, Shikoku is the smallest and greenest. 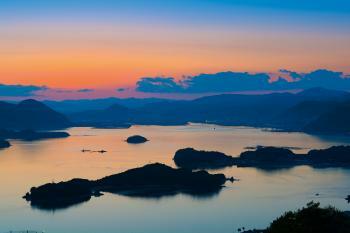 Its north-western flank bounds the Inland Sea, Japan’s own Aegean. Its interior is corrugated by ridge after richly forested ridge. Japan’s holy men were drawn, like me, to mountains. 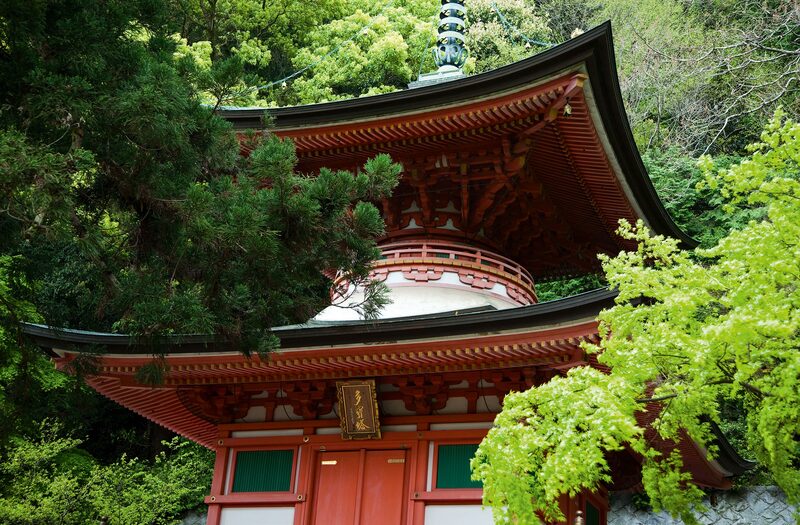 Many of Japan’s Buddhist temples, as well as its Shinto shrines, are built high up. The steps to them seem to lead almost vertically into the sky. On an autumnal day, I arrive panting, faint, my senses astray. My breathing, loud in this spot, a dell in the high forest, soon quietens. Having bowed once at the main gate, I enter and purify my hands and mouth at the ritual basin to the side. And then I swing the huge log suspended beside the bell in the thatched belfry to announce my arrival to the deities. MAIN IMAGE A statue of Buddha stands sentry at the entrance to Iyadani-Ji temple. 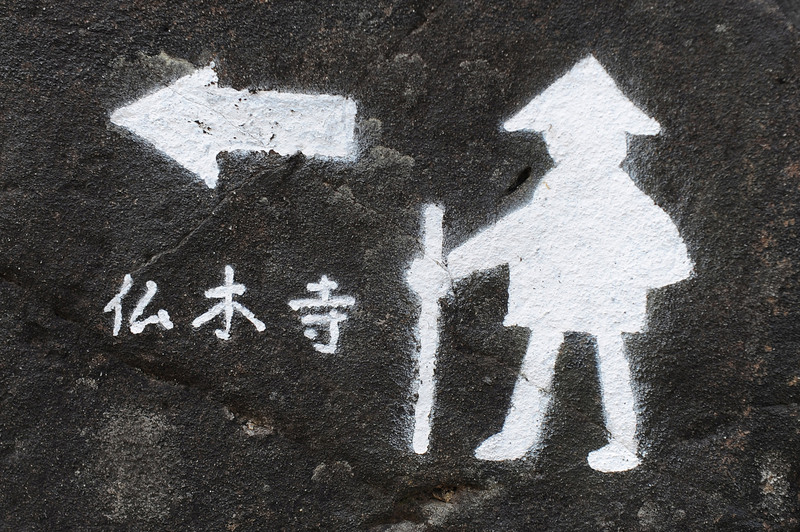 Shikoku is a pilgrimage isle. It was made so by the greatest monk Japan has produced. Kukai was born on the island in 774. After crossing over as a young man to China, he returned with esoteric Buddhist mysteries that had spread from India. Back in Japan, he founded what came to be the important Shingon (or “True Word”) sect of Buddhism, favoured by the emperor, with its headquarters, even today, on Mount Koya or Koyasan, over 100km south of Kyoto. More than anyone else, Kukai, a scholar, poet, calligrapher, social worker and civil engineer, moulded Buddhism into a form that allowed it to flourish in Japan. Posthumously he was canonised as Kobo-Daishi – Great Teacher – of Buddhism. 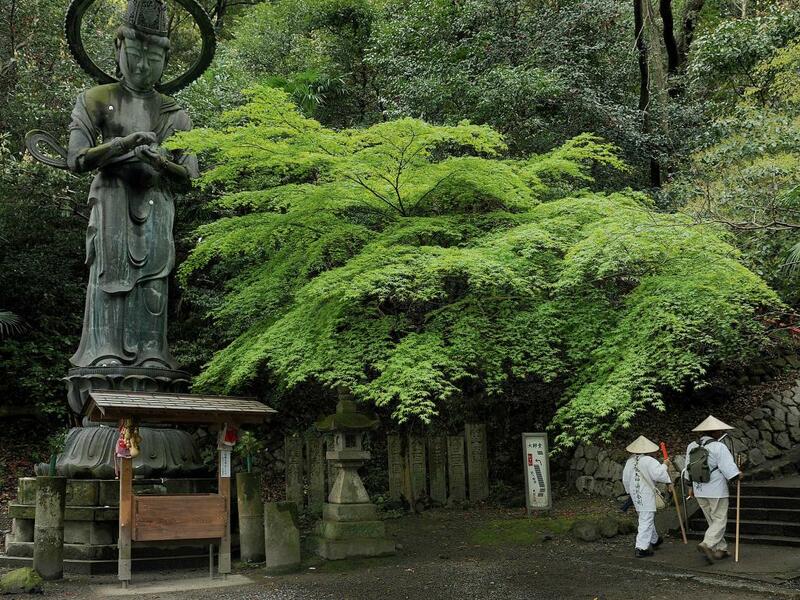 Shikoku’s 88 sacred places are temples marking the route that Kobo-Daishi himself supposedly made. By now such an accretion of legend surrounds the saint that it is impossible to separate fact from fiction. It hardly matters. To visit all 88 temples is to circumambulate the island, usually clockwise, the direction Kobo-Daishi took. A pilgrim does not require much beyond a kongozue, a pilgrim’s staff. Most wear a hakue, or white cotton over-jacket and a wagesa or monk’s stole, to signify asceticism. They carry a monk’s bag containing sutras, candles, incense, a stamp book, which gets marked at each fresh temple, and a conical sedge hat. On the latter is written: “We two – pilgrims together”. The circumambulation takes a good two months by foot but there are no strict rules. You can dip in and out. You can travel by car. 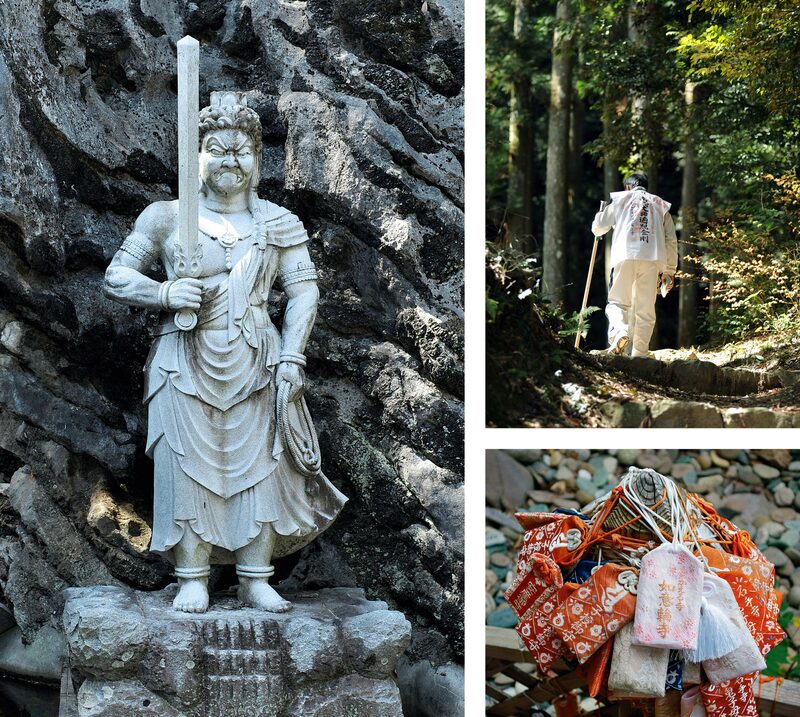 The only requirement is the faith that you are travelling with Kobo-Daishi himself. But travellers have the company of the living, too. This is an immensely friendly pilgrimage. The route winds through cities, along sandy beaches and round dramatic headlands. In the farming country in the west, where I walk from temple to temple, the landscape is gorgeous and mellow. Persimmon trees are heavy with fruit, rice paddies stacked with sheaves, and garden plots spill over with chrysanthemums. Villagers stop to chat and press sweet mandarin oranges into my hands. It is a beguiling place, where people get up with the sun and shape their actions to the seasons. Two temples 5km apart, Ryukoji and Butsumokuji (numbers 41 and 42), are twinned: one celebrates the value of rice and the other, animals. At Butsumokuji, offerings are made not just to little clay figures of cattle, but also to shrines holding pictures of cats and dogs. The priest who, before moving to this rural temple, had administered to Buddhists in downtown Los Angeles, tells me that the association with animals is down to Kukai having arrived on an ox’s back. Tractors have now replaced oxen in the paddy fields, so he does not object that people have widened the temple’s holy remit to encompass other animals. Temple 43, Meisekiji or Bright Stone temple, takes me back into mountains flanked with flame-red maple. It’s that near-vertical climb again. The whole point, as Donald Ritchie, one of the great writers in English about Japan, put it, is that you arrive “new born, helpless, vulnerable”. After ringing the bell, I go to honour the main deity. Nearby is the hall to Kobo-Daishi, the next to be visited. Here, some chant sutras and mantras. I wander about under ancient cedars and gingko trees exploring the nooks and crannies. Visitors can be as informal and noisy as they want – there are no rules as there are in church – though the stillness breeds its own natural restraint. The mountain temples offer another pleasure: when I turn, I see Shikoku ranged out below; at other temples I glimpse the enticing Inland Sea. In contrast to the Aegean, the sea’s many islands are soft and rounded. As the sun sets, they appear, as one admirer put it, “as though cast from bronze and floating on lacquer”. It may not be enlightenment, but for a brief moment I grasp that the act of getting there is more purposeful than any goal. My limbs are aching, but why would I not want to carry on? Shikoku has a humid sub-tropical climate. The best time to visit is March-April and October-November. The traditional beginning is Ryozenji, the closest temple to Koyasan, but if you can’t do the whole circuit the first dozen temples will give you a good taste of things. Alternatively, start where you want and walk for as long as you can. Bring hiking boots. Lodge in spotless ryokan, traditional inns, or minshuku, cheaper family-run versions. 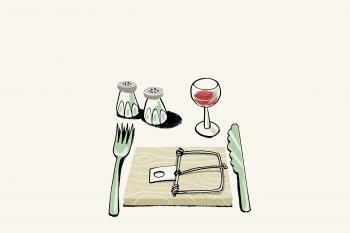 You sleep on futons; dinner and breakfast are included in the price. In towns and cities the usual modern, business-style hotels abound.